A big welcome from the Eastern Shore Players. The Players are an all-ages community theatre group who meet regularly to work on bringing new theatre to the Eastern Shore. Want to Act? New members and helpers are always welcome. Contact us through this website to ask about our next meeting. No previous experience necessary, whether you prefer the spotlight or behind the scenes work. Ages 14 to 100+ interested in joining are welcome to come out and learn more about our Group. We are particularly interested in new youth as many of our Group are leaving for college this year. No reservation required, just come along. The Players are also looking forward to a weekend of workshops scheduled for June. These will be held at Memory Lane Heritage Centre and will be headed by Mary Colin Chisholm, the renowned Playwright, Director and Performer. Is a new play in the works that is being written by Gordon Hammond. This farcical comedy will be performed by the Players at Memory Lane Heritage Centre on the evenings of 13th and 14th September, with a matinee performance on Sunday 15th, 2019. After successful performances at Memory Lane in 2018, the Players took The Secretaire to new audiences at St Genevieve's Church Hall in East Chezzetcook in March. The productions were really well received with the audiences enjoying the combination of music with theatre. A new, original full length comedy drama based on a true story about the SS Graig. Split into four time periods, 1940, 1960, 1980 and the year 2000, the play follows the Simmons family after they salvage a desk from the ship when it runs aground in 1940 off Owls Head. The desk exists to this day and was used in the play after it was donated to Memory Lane Heritage Village last year. However, the drama in the play surrounding the desk, is as far as we know, imaginary! Show dates were 2nd and 3rd November, but if you missed it, the Players hope to perform the play again at one or two other locations in 2019. *With thanks to both Mary Vingoe, an eminent theatre director and playwright, for leading the workshops and to NS Communities, Culture & Heritage for their support. More information about Memory Lane Heritage Village can be found at heritagevillage.ca. As so many people were disappointed to miss the Lobster Trap murder mystery dinner theatre last year, the Players staged it again for three nights at the beginning of May this year to a sold out crowd. 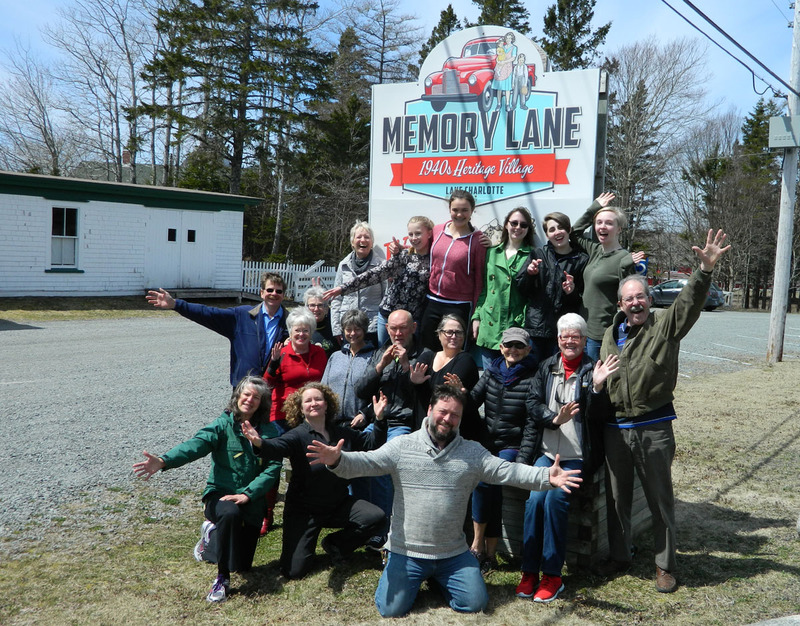 With thanks to Memory Lane Heritage Centre for providing a delicious dinner and to NS Communities, Culture & Heritage for their support, this re-run was a huge success and enjoyed by everybody. Created with the assistance of Pamela Halstead* during a set of workshops, the Players staged an original murder mystery dinner theatre. This comedy was set on the Eastern Shore in the 1940s where there are few complaints from the workers at a lobster canning factory. But murder is afoot after a big announcement that a new business partner has huge changes and job losses in mind. Performance dates were 19th, 21st & 22nd October at Memory Lane Heritage Village, Lake Charlotte, NS. heritagevillage.ca. The Players enjoyed taking part in the Memory Lane Heritage Variety Show which is quickly becoming a popular annual event. The evening was modeled on the musical revues put on by communities across Canada back in the 1940s and the Players' line up included a short play, songs, readings and improv. Added to this were musical guest performances from Charlie DeWolfe, Anna Joy Aylward Burgess and Blair Lopes, along with some brilliant sleight of hand from Lachlan the Magician. 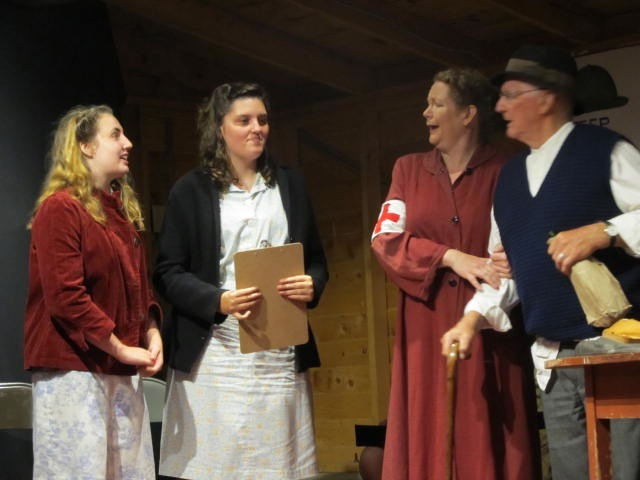 After it's successful run in July at Memory Lane, the Players performed this show again at The Bicentennial Theatre, Musquodoboit Valley, on 13th November. For this second show, we were really pleased to include a group singers from the Musquodoboit Valley area. A Ghostly Encounter was a huge success. Performed as a promenade 'walkabout' theatre production at Memory Lane Heritage Village, Lake Charlotte, on 29th September and 1st & 2nd October, this 1940s comedy was based on a fictional visit to the village by Helen Creighton, the renowned folklorist who collected and published traditional music and lore of Maritime Canada. Helen and her friend, Doreen, are lured to the village with the promise of authentic ghostly tales and songs, but it soon comes to light that the stories have been made up in an attempt to get into her next book. Jeremy Webb and the motley crew! 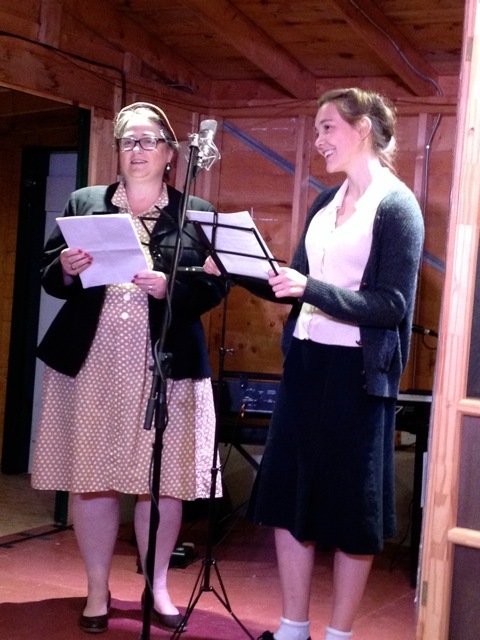 The group`s performances of Radio 1942, A Live Re-creation, were well attended on 8th, 9th & 10th July and well received by the audiences who enjoyed the mix of musical moments, commercials, local and inernational news readings and an original 1942 Gillans script taken from the era. On 8th May: a few of our members performed as part of a Variety Show Fund Raiser for which a letter of thanks was received from Adrien Blanchette. Here is a segment of the letter: "A great big thank you goes out to each one of you in the troupe for contributing your talents towards helping our refugee family. Your professionalism and wonderful and comedic theatrical talent was a notable contribution to the overall success of the evening." A Groom's Folly was a resounding success. Arising from our creative workshops run by *Wanda Graham, this 1940s comedy was about Harry and Lilly's planned wedding day. But if Lilly's widowed Father had his way, the wedding would not take place. He was a self-centred man that relied on Lilly to do all his chores and work in his store. When he was unable to talk her out of the marriage, he resorted to lies in an attempt to discredit the groom. When these failed, he schemed to prevent Harry from showing up at the Church. *Wanda Graham is Artistic Director at Heat Theatre. 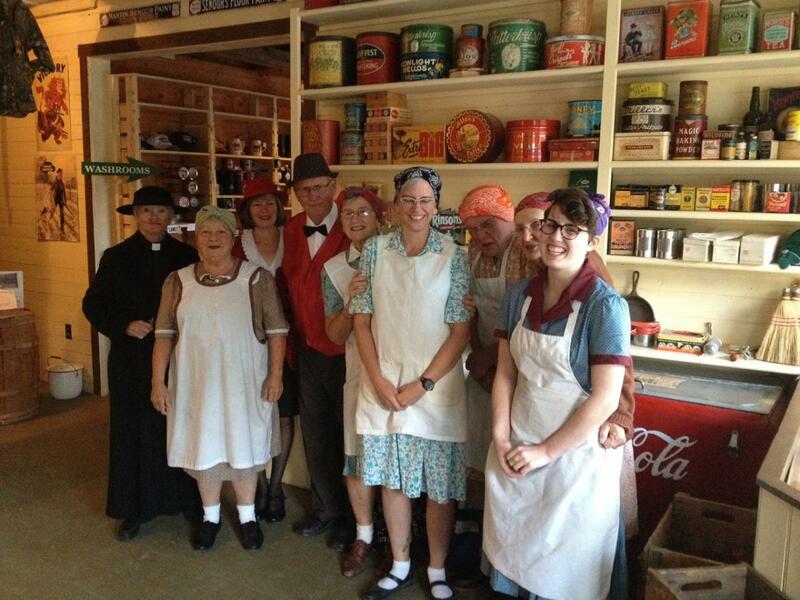 The Players enjoyed great success performing at the Memory Lane Variety Show on Friday, 25th July and Sunday, 27th July. The group performed 'There's No Business Like Show Business'. Odette Steves sang 'Don't Get Around Much Anymore' and Brona Higginbotham and Rowan and Niko Wilson-Henkelmann sang 'Don't Sit Under The Apple Tree'. "New Season", written by Linda Fahie and directed by Robin Webber, is a short 10 minute comedy about a superstitious father of a fishing family who insists that a female in a boat brings nothing but bad luck. It is set in the 1940s and the 1980s. "A Helping Hand", written by Sue Higgs and Directed by Robin Webber, is a 20 minute light comedy based on the Eastern Shore in the 1940s. When young 14 year old Dorothy is taken out of school to care for a family whose Mother is pregnant again, she is greeted with the words "You're late." The Afternoon Theatre & Tea show at the Bicentennial Theatre o on 20th October 2013 was enjoyed by everyone. The afternoon of light comedy was well received and the audience had a good time. The afternoon inlcuded the two WW2 sketches, "Roll Up Your Sleeves For Victory" and "Snapshot of Home" as well the longer play "Free A Man For Service At Sea". Tim Lambert recited two pieces: "The Lion and Albert" and "The Return of Albert"; Gordon Hammond read: "The Rev. Sprott's Journal" and the afternoon included songs from the local men's choir "Coastal Voices". On 19th July, the Eastern Shore Players had a great evening performing "Free A Man For Service At Sea" to a packed house at Memory Lane as part of their very popular 1940s Variety Show. "Free A Man For Service At Sea" is a light comedy set in a Halifax Wrens' recruitment office in 1943 during WW2. In early 1942, when the Wrens were established here in Canada, a training facility was set up at Halifax Dockyard and named HMCS Cornwallis whilst a new base was being made ready in the Annapolis Basin. HMCS Kings at Dalhousie was named 'the stone frigate'. Here they trained Naval Officers. In this play you will meet Officer Leonard, the recruitment officer who is a 'hard nut to crack', Connie and Cathy who are 'joined at the hip' and Ralph Drummond who finds comfort in a whisky bottle, to name but a few of the unusual characters. "Roll Up Your Sleeves For Victory" was the first sketch. This light comedy is set in a Halifax munitions factory during WW2 and the focus is on the importance of the type of work women did whilst the men were at war. "A Snapshot of Home" was the second sketch. Also a light comedy, this is set on a local farm where the farmer is having trouble coming to terms with women doing mens' work during WW2. Photos of the dress rehearsals can be found under the tab PLAYS. Lake Charlotte Area Heritage Society, www.heritagevillage.ca.